RARE! 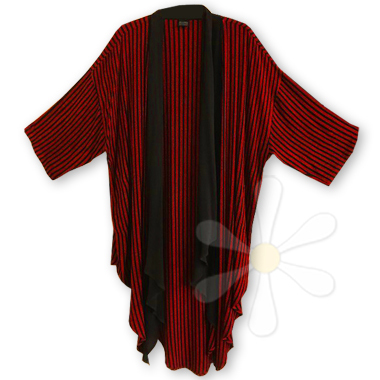 Our gorgeous mid-length duster in Ruby-dyed boucle stripes with black trim! It's as graceful and luxurious as water in motion! Based on various authentic ethnic styles, dreamy sousde fabric ripples and flutters deliciously down the front, and the hemline in back is long and softly rounded. Comfortable AND wildly stylish, you can save it for special events (meaning any time you want to feel special!) but we know you'll find dozens of ways to dress it down to wear more often... It's a versatile must-have layer for your fabulous wardrobe!